Welcome to BloggingeHow.com – a blog where i share my little knowledge about blogging tips specially defined for beginners. My name is Hassam Ahmad Awan, a 24 year old student and a wana-be Problogger. I am glad that you took time to land on this page to know something about me and BloggingeHow in general. I'm a Computer Science graduate, living in Pakistan. I really hope that one day, with the support of you guys, we could make this blog stand out from the competition, in providing quality to the loyal reader, that we have. Before i let you go and read more about how i started, I would like to send you a free copy of my eBook that I compiled for BloggingeHow readers that incorporates A-Z steps that helped me get started. 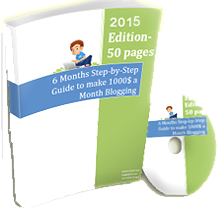 "6 Months to a 1000/per Month", and what i share their (my income/ sources) isn't available on the blog. The moment you'll subscribe, you'll get a copy of the eBook right in your inbox, also you'll be redirected towards the download page that I setup. Its a pleasure to have you in BloggingeHow's family of friends. I would be sending you weekly emails (after every 5-7 days) that would further strengthen your skills to build up a profitable blog as you go along with me on this journey. Back in grade 5, i dreamt of becoming a webmaster. The feeling that kept bugging the entire years was to own a website. Blogs weren't main stream yet. There was one of my friend who used to show his website (free hosting one-Didn't knew back then ). I was like super impressed at then, with his efforts. It was not that i really wanted to do 'something' with the website, but the phrase "making a website" really inspired me. Then it wasn't 4 years back i guess, when i first search the phrase "how to create a free website" and it showed up a wonderful lady's website (Lisa, you can search up), who showed me the 'right' path. There was so much to learn. I wasn't less than a vulture, when it came to getting the most of out my day, to get to reach my destination. I had to get my words out to the world with 'MY very Own' website. Was so fancy back then. Then one year back, i found Blogger and WordPress. This was the beginning of my online adventure. Now after a whole long year, with the support and feedback of you guys, we are here with BloggingeHow, a Page Rank 4 blog with ever increasing community. We recently faced Google's Panda Update, and honestly it was quite a set back to the blogs search engine traffic. But again, we never gave up and moved further with as a community. I am really glad with what we all are turning this blog into, i.e is a loving community where we share what we know and experience in our blogging lifestyle. Being a fitness freak and a bodybuilder, I recently launched my Fitness YouTube Channel and a Facebook page where I upload frequently (Almost daily) Vlogs and gym training sessions. If you wish to explore that side of me, you can head over and subscribe to my social channels above. (Facebook + YouTube). 25 Must Read Blogging Tips For Successful Blog. And, thanks for stopping by and i hope surfing out BloggingeHow would be a productive experience for you.